Where are you most vulnerable, if not in the hands of doctors? You don’t know what they’re doing. It’s likely to hurt. There are needles, saws maybe. Suturs. Staples. Blood. Is there more fertile, gory ground for horror? We say no, and today we celebrate the very best there is in medical horror. Stuart Gordon’s Re-Animator reinvigorated the Frankenstein storyline in a decade glutted with vampire films. 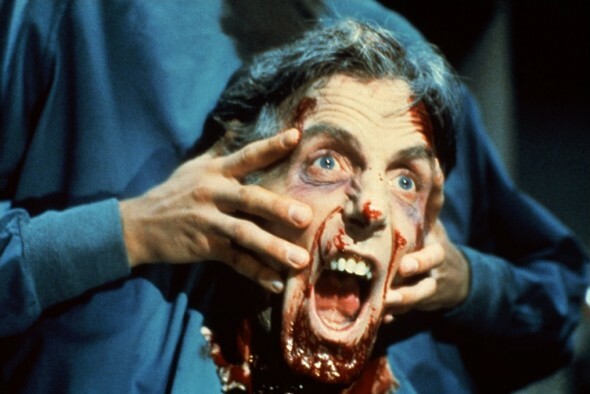 Based, as so many fantasy/horror films are, on the work of H. P. Lovecraft, Re-Animator boasts a good mix of comedy and horror, some highly subversive ideas, and one really outstanding villain. Jeffrey Combs, with his intense gaze and pout, his ability to mix comic timing with epic self righteousness without turning to caricature, carries the film beginning to end. His Dr. Herbert West has developed a day-glo serum that reanimates dead tissue, but a minor foul up with his experimentations – some might call it murder – sees him taking his studies to the New England medical school Miskatonic University. There he rents a room and basement laboratory from handsome med student Dan Caine (Bruce Abbott). They’re not just evil scientists. They’re also really bad doctors. Re-Animator is fresh. It’s funny and shocking, and though most performances are flat at best, those that are strong more than make up for it. First-time director Gordon’s effort is superb. He glories in the macabre fun of his scenes, pushing envelopes and dumping gallons of blood and gore. He balances anxiety with comedy, mines scenes for all they have to give, and takes you places you haven’t been. This film is about separation anxiety, with the effortlessly melancholy Jeremy Irons playing a set of gynecologist twins on a downward spiral. Writer/director David Cronenberg doesn’t consider this a horror film at all. Truth is, because the twin brothers facing emotional and mental collapse are gynecologists, Cronenberg is wrong. Take, for instance, the scene with the middle aged woman in stirrups, camera on her face, which is distorted with discomfort. Irons’s back is to the screen, her bare foot to his left side. Clicking noises distract you as the doctor works away. We pan right to a tray displaying the now-clearly-unstable doctor’s set of hand-fashioned medical instruments. Yikes. Irons is brilliant, bringing such flair and, eventually, childlike charm to the performances you feel almost grateful. The film’s pace is slow and its horror subtle, but the uncomfortable moments are peculiarly, artfully Cronenberg. Obviously, any exploration of medicine in horror cinema – no matter how amateurish that exploration – must begin with Frankenstein. Luckily for Whale, he had Boris Karloff. Karloff’s gift was in seeing the monster as a neglected child. His monster is sweet and tragic, characterized by the terrible freedom of a loosed child full of fear, unbridled excitement, and shame. Karloff nails this childlike energy and ignorance married to a grown man’s strength in a way that no other actor truly has. Join the full conversation on the FRIGHT CLUB podcast.